The dolphin is a small to medium-sized marine mammal, which are found all over the world, generally in warmer waters. They usually inhabit shallow seas and continental shelves. They are members of the order Cetacea, of which there are four families, the oceanic dolphins (Delphinidae), Indian river dolphins (Platanistidae), the new world river dolphins (Iniidae), and the brackish dolphins (Pontoporiidae). Between these four families, there are 40 distinct species. Habitat: All oceans, seas and many rivers. The 40 different species can be found in a vast geographic region, which makes it very difficult to estimate the current population of dolphins. Around 35 of the species live in oceans, while five of the living dolphin species live in rivers. The smallest, the Maui dolphin, grows to an average 5.6 feet (1.7 meters) in length, and weighs 90 – 110 pounds (40 to 60 kg). The largest dolphin is the Killer Whale, which can grow up to 31.0 ft (9.5 m) in length, weighing 22,000 lb (9,980 kg). Dolphins are meat eaters and have a steady diet of squid, fish and crustaceans. Although the coloration of the dolphin varies, they are most often grey, with their backs having a slightly darker shade than the rest of their bodies. Agile swimmers, dolphins are a favorite for wildlife watchers as their playful activities and aerobatics in the water are a delight to see. They are also highly intelligent and can learn to do different tasks just through observation. 1. Dolphins are closely related to whales. The dolphin is part of the group of mammals called Cetaceans. They are divided into two distinct groups – baleen whales and toothed whales. Baleen whales include the larger variety of filter feeding whales (the blue whale, humpback whale, and sei whale among others). Toothed whales include pilot whales, sperm, beluga and many others. Dolphins belong to the toothed whale group. 2. Dolphins evolved from land mammals. 3. 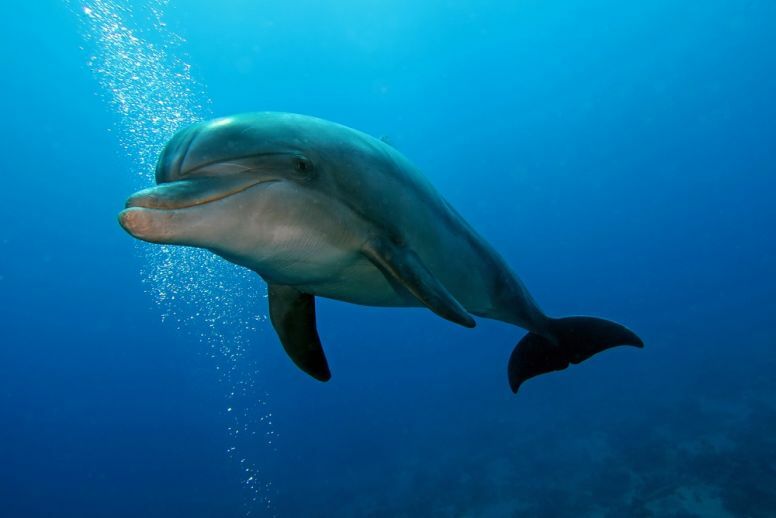 Dolphins communicate with clicks and whistles. This helps them navigate, warn of potential predators and hunt for fish together. 4. Dolphins give each other names. 5. Dolphins and bats share the same superpower, ‘echolocation’. 6. They can dive up to 1,000 feet. Dolphins are excellent swimmers, and can dive as deep as 1,000 feet – usually in search of prey. 7. Dolphins have been used by both US & Soviet militaries. 8. They are extremely social and playful mammals. Pods can vary in size from as few as five all the way up to several hundred dolphins in a group. They will play and hunt together, as if they were part of a huge family. 9. Dolphins look after each other. 10. They are clever and somewhat devious at fishing for food. When dolphins hunt in groups, they will often trap a school of fish and will take turns slicing through the school to catch a meal. Dolphins will also follow other whales, sea birds and even fishing boats to feed on the marine life each scares up or discards. 11. Dolphins can use just half of their brain when they want to. In order to keep from drowning or safe from predators when sleeping, dolphins have the ability to shut off half of their brain, which goes to sleep. The other half stays active so that the mammal can continue to breathe and even swim. 12. There is no clearly defined mating season. The dolphin mating season runs throughout the year. However, there are peaks in spring and fall. 13. The gestation period varies. Depending on the species, gestation can be as little as nine months and as long as 17 months. 14. The female gives birth in an unusual manner. When it is time, the female dolphin will remove herself from the pod of dolphins and may go near the surface of the water to give birth. Typically, there is just one calf, and twins are rare. 15. The mother and calf will spend years together. As soon as a calf is born, it is taken to the surface of the water quickly in order to catch its first breath. Nursing will last between 11 months and two years and following that, the calf will remain with its mother for between another year or up to six more. 16. The word dolphin actually identifies several marine mammals. The word dolphin is actually an unspecific term. The toothed whale group that dolphins belong to include oceanic dolphins (Delphinidae), river dolphins (Iniidae) and Indian river dolphins (Platanitidae). 17. There are many species in the group of true dolphins. Oceanic dolphins are considered ‘true’ dolphins and that group alone contains about 32 different species of dolphins. It is the largest subgroup of Cetaceans. Dolphins have specially adapted lenses and corneas which allow them to see well both in and out of the water. 19. They hear without ears. Dolphins do not have actual ear holes or openings to hear with. Instead, they ‘listen’ with the small slits that are located behind their eyes. They hear frequencies 10 times the upper limit of adult human. 20. Not every species of dolphin has a dorsal fin. The fin located on the back of a dolphin is the dorsal fin. It provides directional control and stability when swimming. However, there are some species of dolphins that do not have this feature. 21. Their pectoral flippers are not used for swimming. The forelimbs on a dolphin are called pectoral flippers, and are not used for forward motion – they are short and rigid, providing the dolphin the ability to steer and control speed in the water. 22. Dolphins probably can’t smell much of anything. Based on their anatomy, dolphins are without olfactory lobes and nerves like all other toothed whales. As they do not have these anatomical features, scientists have concluded that dolphins very likely have little if any sense of smell. 23. They have a mouth full of teeth, but never chew their food. The elongated jaw bone of a dolphin contains as many as 130 conical teeth, but actually they swallow their food whole. Their teeth are used merely to catch their prey. 21. Dolphins have two stomachs. 23. Some Oceanic dolphins have a beak. Thanks to an elongated jaw, some species of dolphins have a beak. It is actually called a rostrum and added to the aerodynamic body shape of those that have one. 24. Dolphins are different to porpoises. They may look similar, but dolphins are usually larger than porpoises, with longer beaks and curved dorsal fins. 25. The oldest known dolphin lived to 61 years old. 26. One species of dolphin is considered critically endangered. The Baiji dolphin, which is a river dolphin found in the Yangtze River, has suffered a severe drop in population over the past few decades. The main cause happens to be pollution that has filled the river with contaminants. The river is heavily used by industry in the region. A scientific expedition in 2006 travelled the length of the Yangtze River to locate and identify the remaining Baiji dolphins. The expedition failed to locate even one and the species was declared “functionally extinct” as a result. 27. Dolphins have been known to protect humans from shark attacks. “From Land to Water: the Origin of Whales, Dolphins, and Porpoises” (2009), via Evolution: Education & Outreach. “Dolphins ‘call each other by name” (2013), via BBC News. “Bats and Dolphins Evolved Echolocation in Same Way” (2013), via Science Mag. “Armed and dangerous – Flipper the firing dolphin let loose by Katrina” (2005), via The Guardian. “Dolphins form life raft to help dying friend” (2013), via New Scientist. “Dolphins often seem to want to befriend us – do they know something we don’t?” (2015), via The Independent.